One of the oldest buildings in Ross on Wye, Market House, was built between 1650 and 1654 replacing the older, probably wooden Booth Hall. It has its origins in the 12th century when King Stephen granted Ross the right to hold a market in the area which stimulated the economy and encouraged trade. The Market House has undergone extensive renovation since its built date. The clock tower was an addition to the building and dates from the 18th century. Today regular markets are still held under and in front of The Market House. On the second floor the Market House now houses Arts and Crafts made by local people. There are a wide range of affordable items ranging from cards to large paintings, with much more in between such as wooden pieces, mosaics, knitted items, jewellery and of course pottery. Everyone is welcome to come in and have a browse. The Market House is now open from 10am to 4pm every day of the week. 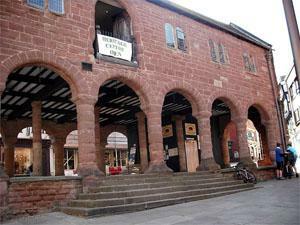 The Market House is no longer a Heritage Centre but it now houses Arts and Crafts made by local people. There are a wide range of affordable items ranging from cards to large paintings, with much more in between such as wooden pieces, mosaics, knitted items, jewellery and of course pottery. Everyone is welcome to come in and have a browse. The Market House is now open from 10am to 4pm every day of the week.